I haven’t blogged for about two three weeks now, I just wasn’t in a sharing mood. Why not make a blogging comeback with some photos of macarons?!? Ha! I know I named this post “BBQ Macarons”, and you were probably expecting macarons in the shape of a bbq, or hamburger or something else cool like that. I’m sorry to disappoint! These were just some nice, colorful macarons made for a family bbq last weekend. Well, half of them were for the bbq, the other half went to my sister who just moved in a new super cute apartment! Now onto the details about these macarons not shaped like hamburgers… The top coral colored ones are cinnamon flavored with plain buttercream filling, and the bottom teal ones are plain almond with coconut buttercream filling. Most people seemed to like the cinnamon ones more, but the kids loved the bright teal and purple ones! Oh, and added bonus, I put too much coloring in them and they ended up staining everyone’s mouths!!! So I was totally able to see who ate what. I had actually made a third batch too, which was maple with maple and cinnamon buttercream filling, but they didn’t come out that great in a few ways. First they were ugly and not very puffy. Then the morning of the bbq I accidentally squished them all right before I took photos!!! CT really loves when I make macarons. She always steals a few off the counter before and after I fill them. So of course I would make some for her birthday party! I tried something a little new with both of the batches. 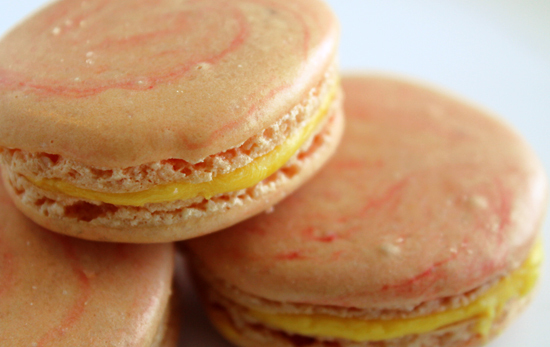 On the bottom of the tray are strawberry macarons with strawberry preserve buttercream filling. These were a bit off in color and size since I used ground up freeze dried strawberries in the batter and I didn’t tint them like usual. Oh and the buttercream was just normal ole buttercream with two tablespoons of strawberry preserves blended in. Super easy! So even though they weren’t super pretty, they tasted great!! The macarons on the top, and in all the close up photos, were peppermint flavored with peppermint buttercream filling. I tried my hand as swirly color, which came out nice on about half of them. I also made them slightly larger than I usually do, which I think made them even better!! I also made a half batch of peanut butter macarons, but those didn’t make it to the party. They were just too good. I feel a lot more confident every time I bake these awesome treats, so expect more posts about them. I have loads of flavor combos I still want to try. Any combos YOU think I should try? For both Thanksgivings I made macarons, of course. The orange ones are pumpkin spice and the brown ones are maple. I was told the maple ones actually tasted like pancakes. They are my husbands new favorites! I’m in the baking mood again, so I’m thinking of trying out some fruit flavored sets. Maybe strawberry or orange?